Chris Tolliver doesn’t remember the play that ended his college football career. It’s a broken recollection, pieced together for him by teammates and doctors. Tolliver was fighting for playing time on a team that would go on to play in the national championship game, and needed to stand out in fall camp, so he tried to make the type of dazzling play that made him a coveted wide receiver recruit coming out of Rayville High School. While in practice, Tolliver leapt high to snag a ball that sailed above his head. A teammate wrapped Tolliver’s legs as he soared in the air. Tolliver spun like a pinwheel, all the while being pulled back toward the earth. His head was first to hit the turf, and the lights went out. Tolliver sustained a Grade III concussion, which rates as the most severe. Tolliver spent most of that season on the shelf getting his concussion symptoms under control. But the only way he could do that was to rest, and he was restless. “It was frustrating,” Tolliver said. “I’m the type of person that likes to keep going, keep working hard, keep getting better. And when I couldn’t do it, the LSU trainers and coaches saying, ‘You can’t practice today. You can’t practice today.’ I was mad. Eventually Tolliver was cleared, but he probably came back too soon. He suffered two more minor concussions in practice, giving him three in a year-long span. LSU coaches and medical staff intervened. Worried about potential long-term damage, they made the call: Tolliver would never play football at LSU again. It’s a sad story of tremendous potential going by the wayside. Not because Tolliver got caught up in the wrong things off the field, but because he was trying to do the right thing on it. Considering the violent and unpredictable nature of the sport, it’s a regular occurrence. Just ask senior guard Josh Williford, who like Tolliver has no recollection of the play that took most of his junior season from him. He’s seen it on film, and that was what scared him the most about the concussion he suffered a little more than a minute into the second quarter of LSU’s loss to Florida last season. Listening to Williford speak about the injury, it almost sounds like an out of body experience. He’s able to recall and describe the play — what the play call was, how he got in position to get knocked unconscious — but only from TV’s camera angles. It’s a facsimile of what used to be unique to his mind. The game film scared him because it was physical evidence of a memory that’s no longer accessible. Zach Mettenberger threw an interception, Williford was working his way down the field to help make the tackle and BAM! He’s blindsided several yards away from the play and lying motionless, face down at the Swamp with LSU’s medical staff rushing to his side. 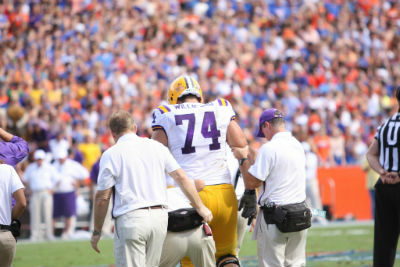 Josh Williford shortly after sustaining a concussion against Florida on October 6, 2012. After the game, Williford ate Chick-fil-A for dinner. But he doesn’t remember that either, not even immediately afterward. He ate, and then asked his mother what they were having for dinner. And he asked again. And again. He spent several weeks in what amounted to sensory deprivation in his lightless room. He unplugged his TV and only used his phone to contact family and LSU’s medical staff. Any other sort of stimulation — light, sound or even intense thought — and the headaches came back with fury. At one point, a teammate told Williford that he’d relayed an entire sentence backwards to him. Williford tried returning for the Alabama game after passing a battery of tests to prove he was ready. But it didn’t take long before a minor collision with former LSU linebacker Kevin Minter brought his symptoms back. Williford was cleared a day before LSU traveled to Arkansas for its regular-season finale, but he wouldn’t play until the Chick-fil-A bowl, nearly three months after his original concussion. He spoke at length Aug. 6 about last year’s concussion after completing his second practice of this year’s fall camp. Two days later, Williford sustained another concussion in practice. He reportedly lost consciousness again, giving him his second severe concussion in 10 months. Tolliver’s career was done. Williford’s season, and now possibly his career: lost. And they’re not alone. Williford and Tolliver are part of a growing number of athletes experiencing major head trauma on the football field, and until recently there was no proven way of treating or rehabilitating their invisible injuries outside of rest and medication. Maybe that’s all about to change. 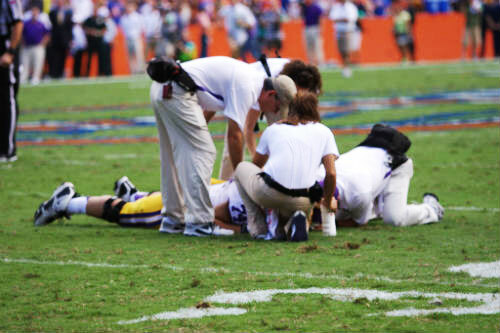 LSU is working with doctors in New Orleans who might just hold the key to eliminating both long and short-term concussion effects. If their research treating brain injuries with hyperbaric oxygen therapy proves fruitful, one of the most pressing issues in sports could finally be showing some light at the end of a long, dark tunnel. And to think, that spark of light could trace its beginnings, in part, to a little sunburn. Is there any more fitting scenario than LSU coach Les Miles potentially altering the course of college football in a light bulb-over-the-head moment of genius? A sunburned Miles decided his sensitive skin wouldn’t get in the way of some exercise, so he went for a run. He returned, huffing and puffing, to find his sunburn felt better. He concluded there was a connection between that sensation and his increased oxygen intake. Synapses fired and dots started connecting. “As a layman, I seem to think I understand it,” Miles said. “I recognized when I was feeling down, that if I’d go take a run I would feel better. One way I would get rid of sunburns was … I’d go take a run and I’d get great blood flow. Miles took interest in hyperbaric oxygen therapy when one of his former players from his time as a Dallas Cowboys assistant coach made him aware of the work New Orleans-based doctors Paul Harch and Keith Van Meter were doing. Miles met with a team physician and set up a meeting with the doctors. His goal, according to Harch, was simple. Harch, who earned his M.D. from Johns Hopkins University, has been studying the healing qualities of hyperbaric oxygen therapy for nearly three decades. Most of his work aimed toward traumatic brain injury has occurred in the last 10 years. The basic premise is fairly simple. A patient gets into a chamber that is pressurized to a level greater than the earth’s atmosphere, and then breathes 100 percent oxygen. In Harch and Van Meter’s treatments, the patient undergoes a minimum of 40 one-hour treatments in the chamber. Through the combination of increased pressure and oxygen, the oxygen is dissolved into the liquid portion of the blood and becomes immediately available for use. The oxygenated liquid blood is transported and diffused to all areas of the body. In addition, recent experiments have found there are more than 8,000 genes in our DNA that are oxygen and pressure sensitive, according to Harch. Hyperbaric oxygen therapy triggers those genes to promote growth and repair hormones in tissue. The science itself has been difficult even for neurologists to understand, but the results from Harch and Van Meter’s prior research have been stunning. In each case, Harch and Van Meter found that single photon emission computer tomography (SPECT) images, which provide a look at the inner workings of the brain, showed improved blood flow to the damaged areas. The difference between veterans returning from combat and athletes, in this case, is negligible. “My argument is, if this works so well for severe (traumatic brain injury), why wouldn’t it work for acute concussion?” Harch asked. Their findings are potentially revolutionary in the neurology field, which has traditionally looked at brain injuries as untreatable. As for Miles, he isn’t limiting the applications to traumatic brain injuries. He said he was amazed by the tale of a diver who was submerged underwater without a breathing apparatus for 20 minutes. When the diver was pulled ashore, he had drowned. The diver was rushed to a hyperbaric chamber and survived. Does Harch believe his research can eliminate a problem that’s grown larger as it’s become more understood? All of their studies have been done with veterans who were several months to several years removed from their brain injuries. They hope the results are even more pronounced if the injury is treated soon after it is incurred. Williford, in Harch’s opinion, is treatable. Here’s the thing about hyperbaric oxygen therapy research regarding traumatic brain injuries — in some circles, it’s viewed as a fringe treatment, kind of like high-tech acupuncture. While Harch and Van Meter’s research has shown it could potentially treat a wide variety of illnesses — like stroke, diabetes and PTSD — it’s been treated with skepticism in the medical world, largely because nobody could explain how it worked. The money is a big issue, as well. Harch charges $200 per treatment at his clinic, which can seem like a lot until you see the average cost is at a hospital is right around $1,800 for the first treatment. It’s been that way at private clinics for some time. Harch’s mentor, Dr. Richard Neubauer, started treating neurological diseases with hyperbaric oxygen therapy. He was having success with his treatment, and was charging “one-fifth to one-tenth of the hospital charge.” This, Harch said, threatened people in two ways. “It was so financially and scientifically threatening and challenging, respectively, that it was heavily criticized and repressed,” Harch said. Currently, outside of the potential use of hyperbaric oxygen, there are no proven ways to treat a traumatic brain injury. The only remedies available are rest, therapy and medication. But buyer beware, said Harch. Hyperbaric oxygen therapy may revolutionize the way concussions are treated. But that’s only one side of the equation. Football, at every level, is taking a proactive approach to limit the number of concussions its athletes suffer, though in order to do this effectively the entire ethos of the football player will probably have to change. The idea that a player is soft if he sits out after a big hit is still a work in progress. But the big hits that were once celebrated will now be penalized. If an illegal hit occurs in the first half, the player will be suspended for the remainder of the game. If it happens in the second half, the player will sit out the remainder of the game and also be suspended for the first half of the ensuing game. SEC Coordinator of Officials Steve Shaw gave a demonstration on how the new rules would work at SEC Media Days, and rolled through a handful of video clips that likely would’ve landed on ESPN’s “Jacked Up” segment a couple years ago. If the rule were in place last season, the player who knocked Williford out would’ve likely been suspended for the remainder of the contest. Maybe Williford would never have sustained a concussion in the first place. But there is some resistance to the rule changes. While player safety is becoming increasingly important, the rule change could have some adverse effects on the game itself. How will an official be certain he’s making the right call when the players are moving so fast? What will happen if the wrong call is made and it effects the outcome of a game? Will the altered style of play result in a new string of injuries, perhaps a rash of torn ligaments as players attempt to slow down before a collision? That remains to be seen. But for now, Miles and his assistant coaches are teaching the players to tackle low. It might even turn into something of an advantage for LSU. “I think the guys that coach it well and coach it best will have an advantage come game day,” Miles said. Football has been good to Miles. It brought him invaluable life lessons while playing under legendary coach Bo Schembechler at Michigan and the financial security that’s come with his success as a coach. That’s partially why he felt compelled to help find a way to treat what’s been a scourge to those playing his sport. Now, it’s Miles’ turn to give back to the game that’s given him so much. It was part of the reason he turned to Harch and Van Meter. It’s not as if LSU can purchase a couple high-quality hyperbaric chambers, drop them in the training room and start treating concussions. Together they proposed a treatment center at Our Lady of the Lake hospital in Baton Rouge, where injured players can begin treatment minutes after being diagnosed with a concussion. The treatment center at Our Lady of the Lake, while not yet operational, is “happening,” according to Miles. Harch isn’t sure if the treatment center at Our Lady of the Lake will be in place by the end of the season, but he would be able to provide treatment in New Orleans if he can find a way to fund it. Before the research can revolutionize the way concussions are treated in the sport, it needs to produce results. But that couldn’t contain Miles from publicly stating his excitement for the possibilities at SEC Media Days. Seconds into his half-hour press conference, Miles began brought up the potential offered by the research. But his remarks didn’t necessarily hit their intended mark. Blame it on Miles’ public speaking notoriety. It was a Twitter punch line. Miles might as well have brought up how he planned to walk on the moon. But it was not a joke.